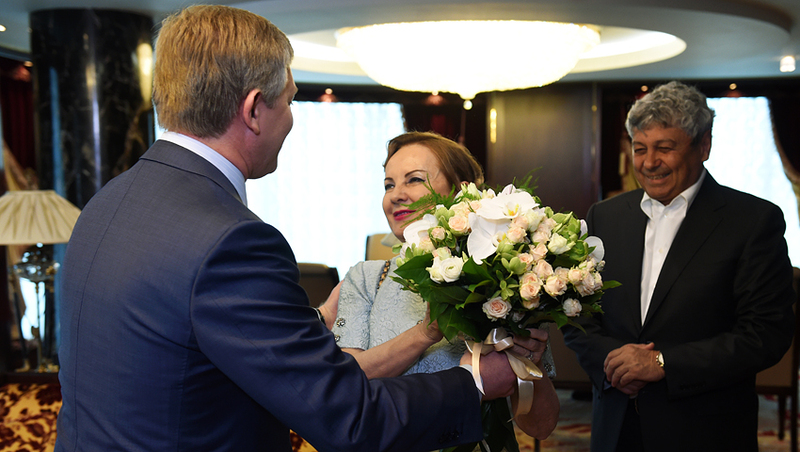 Shakhtar president met Lucescu with a personalised T-shirt, and his wife Neli – with flowers, pointing out that Neli has largely contributed to Lucescu’s success. Rinat Akhmetov thanked Mircea Lucescu and handed him a shirt featuring the number 573, which represents the number of appearances he made being at the helm of the team. - We are in a very difficult situation: so far, we have been playing away for two years now, - said Rinat Akhmetov. - Maybe someone does not see that? Or someone finds it favourable to ignore it. But it’s really been very difficult for us. And I want to say: we have adapted! Had I thought that by playing away we couldn’t win the gold medals... I want to keep in my hands only the gold medals of the Ukrainian championship and to win in Europe. Mister is a very ambitious person. I know just one thing: wherever he turns up, he will give his all to win every match! I know that his heart is always with Shakhtar. I am convinced that Shakhtar is in his heart forever. Wherever Mister happens to be, now he needs new challenges and emotions. Playing away and, for instance, in front of the empty stands - it's a completely different taste. At his 70, Mister feels younger than me. And he looks younger than me! God grant that he coached for a long time. But he needs new challenges. And Shakhtar need some new blood. In this situation, I am convinced that this will benefit everyone – Mister, Shakhtar and the fans. In turn, Lucescu said with a smile that his Shakhtar story began and ended with the Ukrainian Cup, after which he also spoke of his friendship with Rinat Akhmetov. - The president of the club was more to me than just a president, - stressed Mircea Lucescu. - He has become my very close friend! We always talked to him about the developments and what needed to be done. Every day, the president was by the team’s side. - Mister has deserved it! We always can and should trust him. Mister can talk, but to think about something else... He always keeps 18 different moves on his mind. But I know for sure that he will be at the Donbass Arena! Whoever coaches the team, he would be happy to entrust one game to the head coach of Shakhtar Donetsk at the Donbass Arena. He deserved it. Where was Shakhtar Donetsk and where the club is now: for all this is backed by the hard work, ambition, the ability to win, overcome difficulties and obstacles. And in the end, to keep the trophy in their hands! Not everyone can do that. I want to say a huge thank you to Mister the coach. And I don’t say goodbye to Mister as my friend and to his wife Neli! I can always come to their place, and they – to my place. Together, we have experienced a lot of sentimental moments. We have been friends and we remain friends.